The Mayor’s office is in this building. Why all the arrows? What did it mean, back whenever they built this place, to fill the void’s arc with arrows flying toward a sun? Why is it called God’s House? I know some of our French readers will let me in on the story, but while I walked the streets of Bonnieux I always found myself discovering these vestiges of the past that play differently in today’s world of symbols. And what will the future readers of our municipal leavings make of our logos and brands and symbols? I don’t often collect this kind of imagery, it seems too static and perhaps too easy to pluck it out of the surround and stick it in the file, and then what? But on the other hand, sometimes these odd musings on time’s leftovers can lead the way to a fresh thought about something that may be there in a corner of our minds and we don’t yet know it. So I carried this away with me – it’s so light – and I remembered that once before, for Maggie, who’s a writer, I found a doorway arch just like this, and it had a lovely and elegant metal hand holding a pen! I did add it to the file. This entry was posted in Provence, Uncategorized and tagged Bonnieux, France, Provence, Wall on March 5, 2015 by joelmeyerowitz2014. 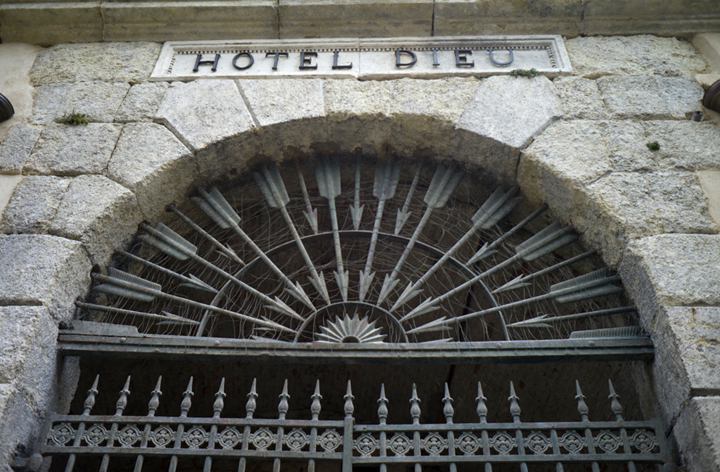 From Medieval and Early Modern times, in France, hospitals were known as ‘Hotel Dieu’: Curing the body and Healing the soul. Nothing to do with nowadays hospitals.